One of my favorite things about fall is enjoying all of the wonderful autumnal fruits. Eating fresh apples and drinking cider is reminiscent of a breezy fall day. However, most people don’t think of pawpaws as being one of autumn’s many delights. In fact, the majority don’t even know what pawpaws are! Read my previous post and watch the video on eating fresh pawpaw fruit to find out more. Anyone who enjoys a fresh pawpaw will discover several brownish-black, lima bean shaped seeds which fill the interior. These seeds are inedible to humans and most mammals. A good pawpaw, and especially improved selections, will have a low seed to pulp ratio. After eating a few pawpaws you will have accumulated a fair amount of seed. But what can they be used for? Well, aside from making beautiful jewelry(something we’re experimenting with! 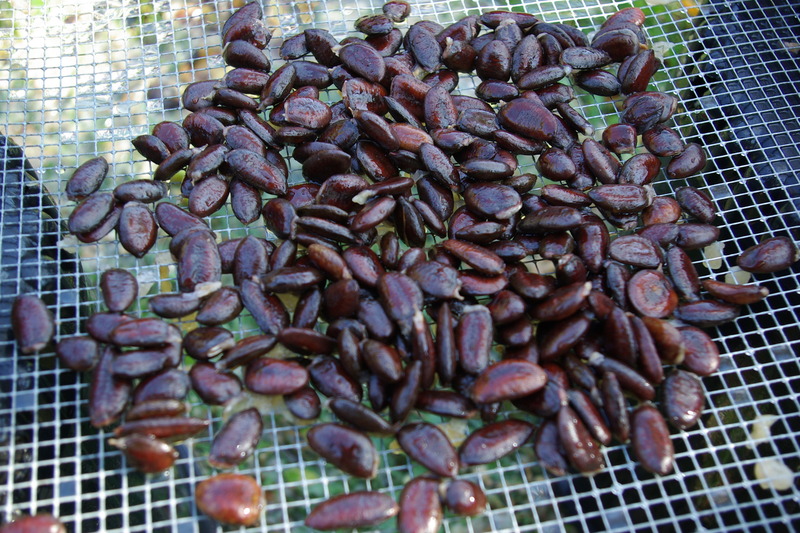 ), pawpaw seeds can be used to propagate new trees! Since fresh pawpaw fruit is rarely found commercially, the best way to obtain the fruit is by planting a few trees in your yard. The trees are readily available in the nursery trade, but growing your own from seed is an exciting challenge to take on, and its a great project for kids! Pawpaw trees grown from seed can take anywhere from 5-10 years to reach fruition. If you’re interested in propagating pawpaw trees in some quantity, then you’ll need an efficient way of extracting the seeds. If you’re only going to grow a few trees, then simply extract the seed with your teeth as you indulge. What follows is a brief tutorial on how to extract pawpaw seed en masse. This method can be scaled up or down as needed. 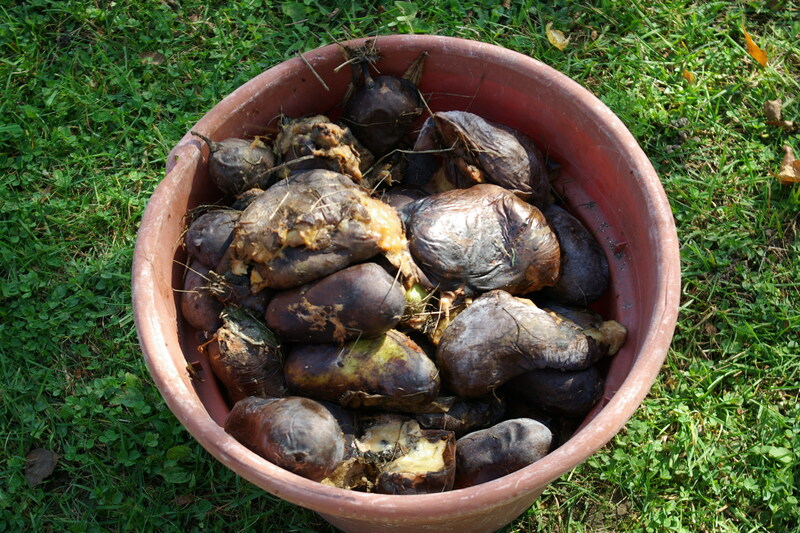 Start with a bucket full of pawpaw fruit, you can use ripe fruit, or overripe and rotten fruit. If you’re using high quality ripe fruit then make sure you save the pulp. 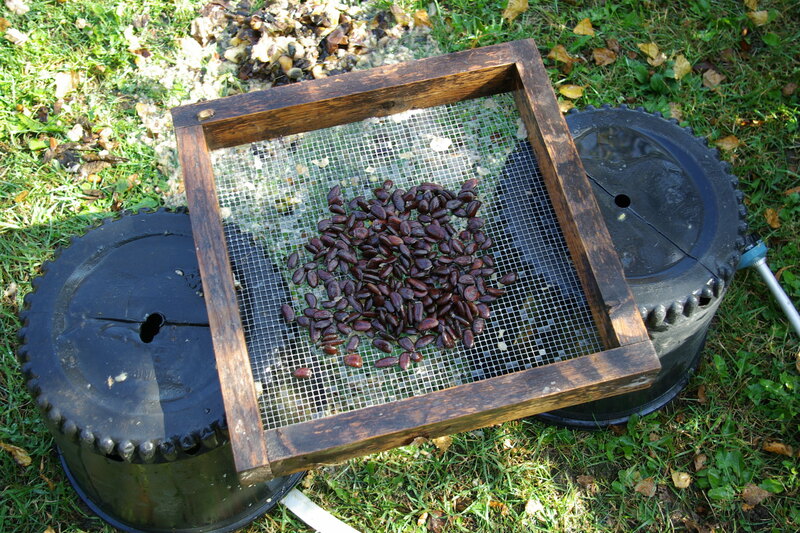 For this technique you will need several pawpaws, a hose, two pots or buckets, and a mesh screen(1/4″ stainless steel works well). As a warning- pawpaw fruit is attractive to flies, and if kept indoors they will inevitably attract a lot of fruit flies! Overripe pawpaw fruit used for seed extraction. First set screen between two upside down pots or 5 gallon buckets, so that the screen is elevated and the pulp can come out beneath it. 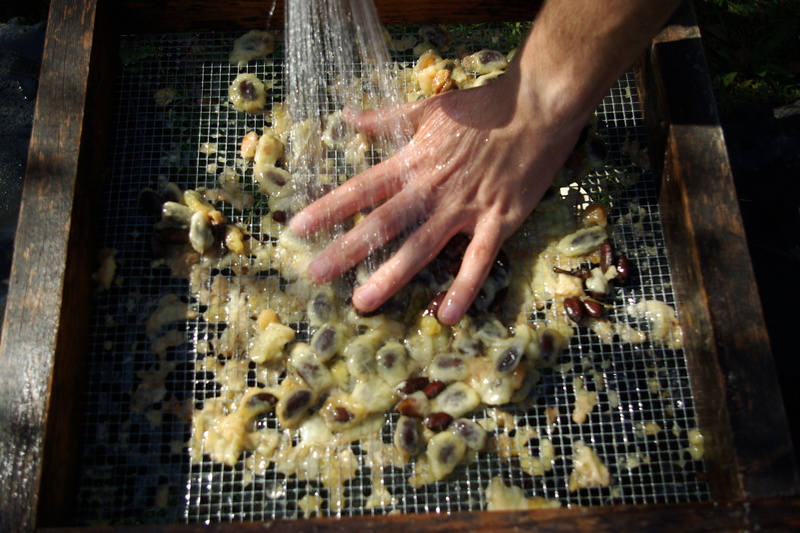 Slip pawpaw pulp and seeds out of skins onto screen. When using overripe fruit the skins come off easily. If you have a lot of pawpaws, then do them in batches and only cover the screen about 3/4 with pulp. Too much pulp at once will make it difficult. 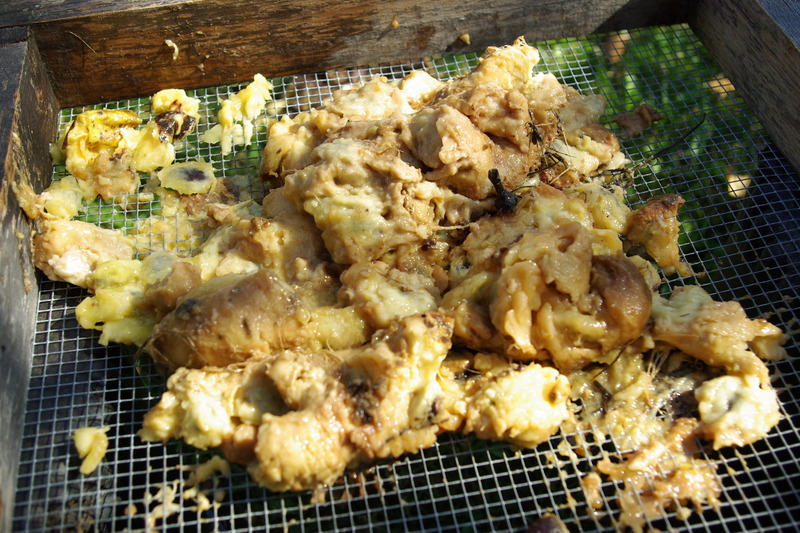 Pulp and seeds removed from skins and placed on screen. Now that you’ve placed your pulp and seeds on the screen, begin to rub against the screen while spraying the pulp with a hose gun (shower and flat settings work well). Continue to irritate the mixture while spraying to assist in pushing the pulp through the screen. A combination of rubbing and spraying pushes the pulp through the screen. Pawpaw seeds come encased in a thin gelatinous membrane which protects the seeds and facilitates germination in the wild. However, for our purpose we want to remove these membranes. You will know you’ve rubbed the seeds clean once they’re free of the membrane. Eventually you’re left with almost entirely clean seed which can be soaked in warm water for ten minutes or so to remove any excess pulp or membrane. Once you’ve completed the process you’ll need to store the seeds immediately without letting them dry out (tutorial coming soon). Try using pawpaw seeds for arts and crafts or jewelry making! Finished pawpaw seeds ready for storage. Seed extraction is just the first step in the process. Stay tuned for upcoming articles on storing and stratifying pawpaw seed, and processing pawpaw pulp for eating. I hope this article has been helpful to you; feel free to ask questions and give feedback!